A relatively painless 23 hour bus ride from Cape Town to Windhoek saw us try Nando's in its natural habitat and marvel at the fast food consuming capacity of our fellow passengers. We backpacked up for the first time of the trip and walked to Cardboard box Backpackers. We spent forty-eight uneventful hours here, enjoying the pancake breakfast, lazing by the pool and trying to plan what we were going to do in Namibia. We had no real idea what the country consisted of when we showed up, and it soon became apparent that our plan of hitching and public transport wasn't going to work. We resolved to once again hire a car and dash madly around the southern half of the country. Windhoek turned out to be a very small capital city, with not much happening. Wandering through the Post St Mall, with many shops selling african curios that we wanted to buy but will save for later in the trip, and the collection of a dozen or so meteorites that sit at the heart of the complex, did while away an afternoon. Tom ran to Eros Domestic Airport to pick up our hired Corolla (six speeds and a 1.6L engine, cop that Chevy spark) and we soon started our long drive to Fish River Canyon. We drove straight down the majority of Namibia, racking up over 670km for the day, but arrived in the mid afternoon, early enough for a swim at the deserted Hobas Campsite. After an early dinner constructed on a fire of scavenged materials we drove the 10km to the main lookout. The view was absolutely ridiculous. The canyon stretches as far the eye can see in either direction, five kilometers wide, three hundred meters deep at the bottom and with sheer cliffs all around. We marveled, absolutely dumbstruck. The place is magic. As the sun set over the back of the canyon, the colors in the sky lit up the depths of the winding snake of the ravine. The evening was only made even better by a show of forked lightning dancing across the hills to the north. We'll put up some photos of the canyon when we can, but they do the place absolutely no justice. During the dry season it is possible to do a five day, eighty kilometer walk through, and both of us hope to return to do this some day. The next morning we got up and wandered out to the viewpoint again. Daylight didn't hurt the spectacular views, and as we drove around a small section of the canyon we just stared at it. That and continually saying "wow" we're about all we were capable of. Oh, also throwing rocks down the sides hoping to hear them land hundreds of meters below. Tom ran the dirt road back to camp, remarking upon return that it was "quite hot", at thirty-two degrees, and became an attraction for passing tourists to photograph as he died in the dust. We tried to negotiate the best route to drive to Sesriem, a small camp about what we thought was 450km away. Long story short, we arrived 650km later, hot, tired and ready for a glass of our lukewarm cask red. We hit the tent early for a pre-dawn wake up the next day. Surprisingly, we managed to get up before five am. We drove out to Dune 45, the most easily accessible of the Namib Desert's red sand dunes. Climbing this couple of hundred meter beast in the dark was tiring, and the sunrise was a little underwhelming due to the overcast weather, but the views were still fairly amazing. Driving on we arrived the the two wheel drive car park, where we had to abandon our car and decide between a five kilometer each way trek through the sand or to pay $12 each for a return shuttle in a 4WD. Needless to say we booted up and walked. Turning off the trail to the Deadvlei, we were rewarded with an landscape of a dead valley (the literal translation of the name), with a baked white pan full of blackened, twisted trees. This was entirely surrounded by the mountainous dunes, a very surreal place. Wandering on we arrived at Sossusvlei, a similar place but with a much larger pan of cracked white clay. We basically stood there, turning in circles looking at the landscape, and laughing at the terrible desert fashion of a 4x4 truck full of Koreans. The pink polyester track suits, full Ralph Lauren outfits and one man bearing a murse provided some solid snickering. The walk back heated up as the sun came through the clouds and we felt we had definitely deserved our peanut butter sandwiches. The afternoon saw us laze about the pool before having a campfire dinner and some tea, boiling water heated in an emptied baked bean can. The next morning we were again early risers as we wanted to hit Windhoek in time to do some shopping before returning our car. The 320km drive started well enough, until we encountered a fearsome squirrel. A few kilometres outside Solitaire, Mads was driving and swerved to avoid this devil critter. The road was gravel and as she attempted to straighten the wheels lost traction, the car spun 180 degrees, hit the side of the road and rolled. Completing three quarters of a barrel roll, we came to a stop amid smashed glass and an enormous amount of dust. Checking we were both ok, Tom opened his door, which was now the roof, and held it as Mads climbed out. Signaling down a passing bus, the driver checked we were ok, which we were, though shaken. With the help of a few passengers, Tom and the driver pushed the car back onto its wheels, we grabbed anything valuable and were given a lift to Solitaire rest stop. Here we were helped by some local staff who called the rental company, drove us back to collect our bags and even set us up in a room in the lodge for the day while we awaited our tow-truck. Whiling away 4.5 hours stress eating at Moose's famous desert bakery (the apfelstrudel, wow) we slowly came out of shock and realized how lucky we were to have walked away unscathed. When the tow finally arrived we both were pretty relieved...but not for long. Riding in the cab of a non-4x4 truck without seatbelts we were white knuckled for the entirety of the 4 hour drive home through mountain passes on unsealed roads, in pouring rain, while the driver texted, swore a lot and frequently made the sign of the cross before attempting a tricky stretch of road or river crossing! Traumatic doesn't begin to describe. Made it back safe to the backpackers to set up our tent in the rain, having a meal of packet Indian curry and mealie pap and crawling into bed. Luckily we were saved by a local called Louis, who popped us in his landrover and drive us to the minibus station in town. A few hours later we were dropped in Gobabis, where we've hitched a lift on a furniture truck to Ghanzi in Botswana. So we've just passed the border and looking forward to country number 3. Hopefully the rest of the trip will be not quite as life threatening as the last few days, but then again, this is Africa! EDIT: got out of the truck about 100kms from Ghanzi after they told us they weren't actually going the whole way. Ended up travelling the last 100kms crammed in the back of a ute with two rather large local women and our packs. Got dropped on the main road and have found camping for the night. Have splurged on a beer each before our hearty dinner of oats and uht milk. About 350kms left to hitch to Maun tomorrow. John Stone Hi Mads and Tom I just want to go to some of those places. Hope you are collecting maps etc. Not so envious of the UHT milk and oats dinner though. glad to hear you are both well and still exploring. Sue Eldridge sitting on a cool Tuesday morning in Melbourne the expanses, heat and dust all seem very distant. glad you have got back on your feet and are adventuring on. Jenn Hi there! Great blog!!! 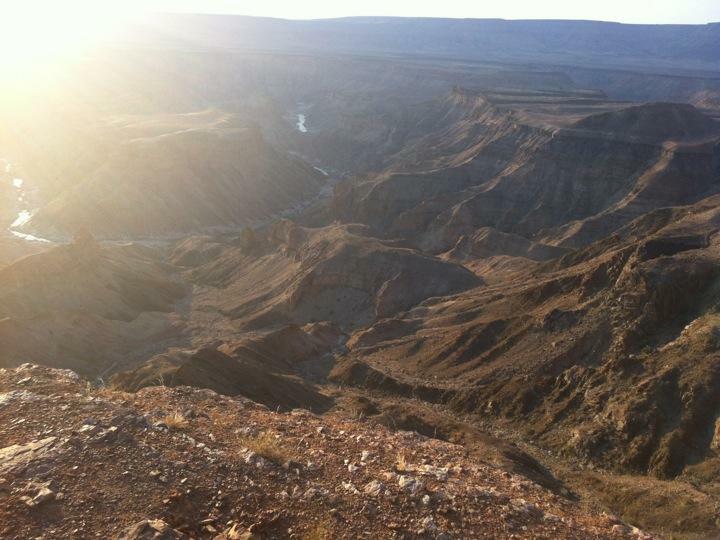 I'm hoping you would be the perfect person to answer my question... even though I'm writing to you 2 years later ;) You mentioned that your trip from Fish River Canyon to Sesriem was 650km... could you please tell me (approximately, from what you can remember) how long it took you to drive this distance? 8 hours? 10 hours? More? We are planning on leaving FRC early in the morning, but have to be at Sesriem Campsite before the gates to the park close around 6pm the same evening... can this be done (provided we don't run into a major emergency)? Thank you so much!! !